How many calories in that dressing cup on the side? It’s a godsend, right? Well, maybe. 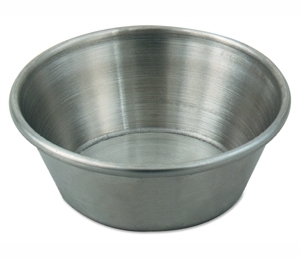 In the restaurant trade, this item is apparently known as a sauce cup, a souffle cup or a portion cup. I like the latter term because portion control is what so many of us lack. Our well-intended salads mutate to mock us: “Oh sure, you ordered a salad! But will you LOOK at the high-fat dressing that’s on it?” OK, busted. That’s where that little cup comes in. We pick it up, pour it on, smug that we are in control of our cellulite. Ah, if it were only that simple. These little gems come in a variety of shapes, sizes and materials. Search “plastic portion cup” in Google and see what you get. It’s confusing. I found black ones, white ones, clear ones, polystyrene ones, stainless steel ones and ceramic ones. I found them in sizes ranging from 3/4 ounces to 3 1/4 ounces. The size I regarded as the most common turned out to contain 2 ounces in plastic but 2.5 ounces in stainless steel. But they looked the same to me. Plus, that 2-2.5 ounce cup isn’t what you want anyway. Look on the side of that dressing bottle, my friend: the nutritional information calls for a 2 tablespoon serving — which is 1 ounce. That’s a double portion pointed right at your hips. Defend yourself. 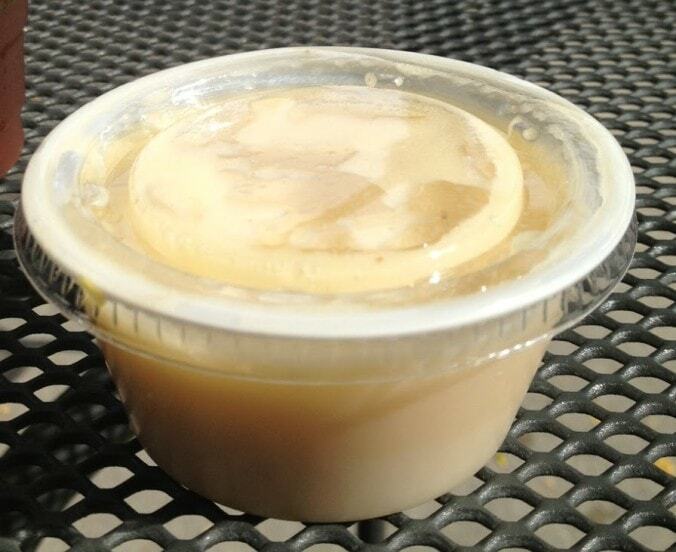 Ask for a tablespoon and drip it on gingerly. It may not be as accurate as the tablespoon measure in your kitchen, but it’s also unlikely to be a double shot. Oh, and if the dressing comes in one of those little silver gravy boats, run. Immediately. An old tip from Denise Austin. Take your fork, dip it in the salad dressing, then spear your salad. It works, too! They are little bowls with measurments on the side. But the BEST part is that they actually measure in tablespoons too. Fo extra accuracy, I actually weighed 30mL (which is 2tbls or 30mL and the serving size on most dressing bottles) of two different types of dressings in the cups. Sure enough, the scale hit 30mL right at the two tablespoon mark, so if you dont have a scale, it still works out. I did creamy and oil based dressings, and they both came within mililiters of each other. With this, you really can’t go wrong and you can get nicer ones, if you dont want to look like you are eating with tupperwear, just make sure they have the 2 tbls on them. These are the ones that I own, so these are probably the safest bet, if you dont have a scale. Trish: this is great. Thanks.